The Leading Informatics for Tomorrow (LiFT) Scholars Program is a multi-institutional program offered at the Indiana University School of Informatics and Computing at IUPUI and Ivy Tech Community College Central Indiana. Funded by the National Science Foundation (NSF), the program seeks to increase the quality and quantity of information technology (IT) professionals by offering scholarships to academically talented, economically disadvantaged, and underrepresented minority high school graduates. 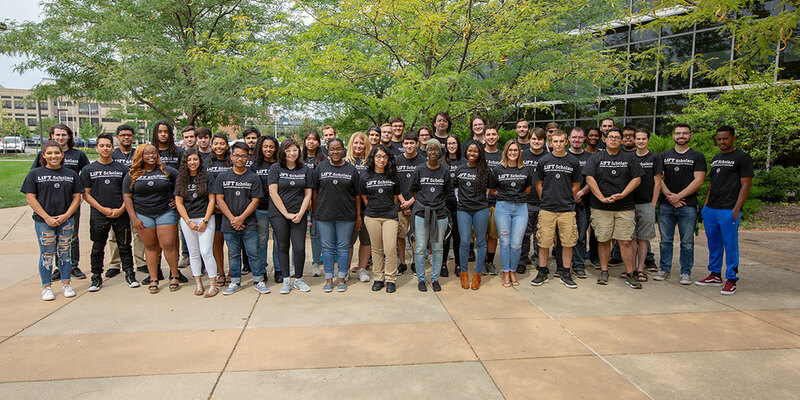 Beginning in the fall of 2017, LiFT will support 20 students each year from the School of Informatics and Computing at IUPUI who are pursuing the bachelor’s degree in informatics, and 20 students from Ivy Tech who are pursuing associate degrees in the School of Information Technology. This NSF-funded program is funded through August 31, 2021. When combined with other student and federal aid, renewable LiFT Scholarships allow students to complete their degrees in informatics with limited or no educational debt. All LiFT Scholars are eligible to receive an additional unmet-need scholarship award up to a maximum of $7,500 at IUPUI and $2,500 at Ivy Tech. This unmet-need scholarship is renewable for students who meet program requirements. Students can pursue their college degrees in information technology areas (e.g., cyber security, software development, informatics, computer science) from the School of Information Technology at Ivy Tech Community College or in informatics from the IU School of Informatics and Computing at IUPUI. LiFT Scholars from Ivy Tech Central Indiana who are pursuing an associate’s degree in informatics will have the opportunity to transfer to the School of Informatics and Computing at IUPUI to pursue the B.S. in Informatics upon meeting admissions requirements. Students at IUPUI will also have the opportunity to live in a residence-based learning community in IUPUI campus housing with fellow LiFT Scholars and School of Informatics and Computing students. The goal of the LiFT Scholars program is to prepare students to enter the informatics and Information Technology (IT) workforce upon graduation and/or to pursue graduate studies in informatics. Providing a sense of community with fellow informatics and computing students. Helping to build personal and professional networks. Fostering leadership and career development. LiFT Peer Mentors provide encouragement and support to LiFT scholars at IUPUI and Ivy Tech to support their success and academic and social integration into the LiFT Scholars Program and their institution. Peer Mentors may also serve as student assistants for the program providing administrative and logistics support to the LiFT Scholars Program overall. Peer mentors are critical to the success of the LiFT Scholars Program and we are happy to have five peer mentors for the 2018-2019 year! Download our one page information sheet to share with your students. As you connect with and support your current high school seniors, encourage them to apply to IUPUI and Ivy Tech early and most importantly file their FAFSA as soon as possible to determine if they are eligible for need-based federal financial aid.